We all have an idea what a typical carving knife looks like, so imagine my surprise when at first glance, the Abegglen knives looked more like gouges! Of course you only have to look at the profile of the steel to realise that they aren't gouges, and that if anything, they look pretty similar to the Ray Gonzales hooked skew tools from Ashley Iles. But what makes these Abegglen knives stand out from the crowd is the fact that they have two cutting edges - a round cutting edge on one side, with the other being a hollow cutting edge, making them potentially very versatile. 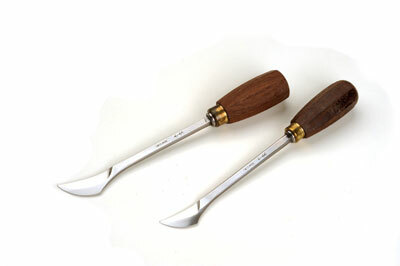 The knives have short hexagonal acacia wooden handles and a blade length of 130mm, with a cutting edge length of 33mm. They available in small, medium and large profiles. These caught my imagination pretty quickly and I was eager to test them out on a couple of projects I had on the go. The short, hexagonal handles are very comfortable to hold and you can really get a good grip with them - so far so good! The blades come sharpened and honed, and are therefore ready to use, straight out of the packet, as you would expect from a Pfeil tool. And in use, these really do cut keenly! 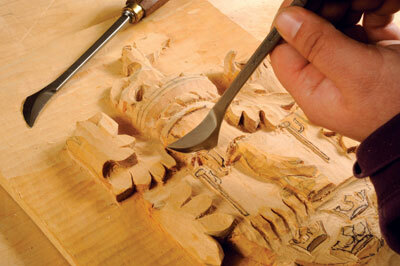 They slice through the wood and produce satisfyingly fine shavings. Given that there are two cutting edges here, which are at the end of a rather long and slim blade, getting into tight corners and hard to reach areas is something of a doddle, as you can use whichever side is nearest to the required cut, and either side of the knife cuts just as well as the other. And as for producing deep cuts, well look no further! The Abegglen knives are, in my opinion, just wonderful in concept and design, and they perform remarkably well. They will be an asset to any woodcarver working on a range of projects from lettering, architectural, figure carving and fine, detailed work. They are so good, you'll wonder how you ever got on without them!